Wow, that is a heavy word…. next please! Well, the current Jewish year, that ends on Oct 2nd 2016, is officially a Jubilee Year. Of course it is fair to say that in Christ, the year of the Lords favor is Now, and we are always at liberty to enter His rest (Heb 4), but it is with confirmed historical confidence that we should expect God to honor his established days and years in some manner. I have been prompted in prayer about this all summer, and here we are. I have been so, so thankful (in jubilation even) that we have been spared problems and granted great favor over the course of 2016 in what is otherwise a world-wide house of cards. With that backdrop however I have felt a strong warning from the Holy Spirit about this next season. Not to bring us to fear or fall into escapism, but simply to be prepared. For what exactly? I don’t know. Let’s be sober-minded, full of love and grace, and pray — and we’ll hear! We long for His return first and foremost, and yet we also keep our lamps fueled in this world. Although I know a good amount of preppers and consider some to be among my dearest friends, preparing myself for future setbacks of any kind has been very difficult to prioritize. I am not known for being the most disciplined saver and most of my adult life so far has been spent just trying to make ends meet raising 5 kids in California. Not that I am complaining, but just being open about my own difficulty with securing back up resources over the years. Not only that, but my affinity has always been more in living for each day, content with daily manna, and trusting God for the future, which makes preparing even less of a natural tendency for me. Fortunately or unfortunately, I am not alone. When I lift my eyes to look around, I see the lack of reserves and debt in our culture is not just a common individual story, but a systemic one. Governments are overleveraged in debt and going the way of all failed civilizations of the past — debasing their currency to extract the wealth of her citizens. Gee, it would be nice to do that as well… A little quantitative easing from a basement printing press is always tempting, but I digress. Plus, the FED hates the competition. You, like me, may not be used to hearing the voice of God telling you to prepare for a future negative event, so before you dismiss this warning, spend a little time in Matt 24:15-22 just knowing that God in His mercy, does warn his people in practical matters to spare them calamity. In a word: Light. I bought a solar lantern and am thinking of turning off the electricity tomorrow for a day at the house just to see what else I would need if power was down for a spell. I am preparing to be content to read and pray in new situations that are outside of the norm, and I have to believe that my fellow believers are doing the same. As you may know, I have been tending a small food supply in the back yard with chickens for eggs, fish and veggies in the greenhouse and have plenty of water stored up that I can use if needed that I can use with my berkey filter in the house. I’ll do more this weekend as the Spirit leads and as we watch daily. Please do the same, and NEVER NEVER get caught up in to fear! In closing, as I shared with my brothers on Wednesday, remember that CHRIST IN YOU is the hope of glory for the world today, and that is why we are still here. With that in mind, please meditate on this verse, knowing that God is still working through CHRIST IN YOU to declare these things in our generation. Thanks to Mike Moore for encouraging me to write this down. Please google more on this topic and share your thoughts below. What a wonderful time we had! 30 friends from 3 church communities… neighbors, friends and more. We feel your love and are so glad you came! Our journey into seeking responsible food independence has opened up a whole new appreciation for the way God does things compared to man. God creates ecosystems of harmony. Man isolates wealth out of ecosystems, refining its resources for mass production, creating waste. Learning aquaponics (AP) has raised my respect for how God does life, as well as how Jesus introduced to us a whole new conception of life. “He who has the Son has the life”, but I digress… The AP connection here is that it is tending to a natural ecosystem without the need for chemical (or otherwise imported) intervention like traditional farming or hydroponics. In AP, even the water is circuited instead of soaking away into the ground. Healthy bacteria break down waste and the plants clean the water. When we need answers on how to correct an imbalance, we can look to the pre-agro-business era and look how God forms healthy ecosystems. Science should respect nature and natures God, not seek to cheat it! In fact, “the creation itself also will be set free from its slavery to corruption into the freedom of the glory of the children of God.” (Rom 8:21). If you can accept it, connecting to how God does things has become a very distant reality in the modern world of today. If we can connect again to how God works with our own hands, we can be a liberating catalyst. Anyway, again I have digressed. Please read this from your heart and ponder. To the practicals… I worked hard last week to pull the plumbing together in time for the dedication. 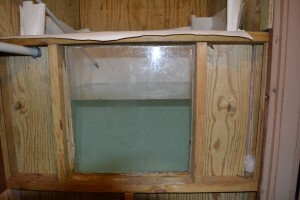 The liner is in place, the water has circulated fully, and I found just one leak in the fish tank that I need to work on. 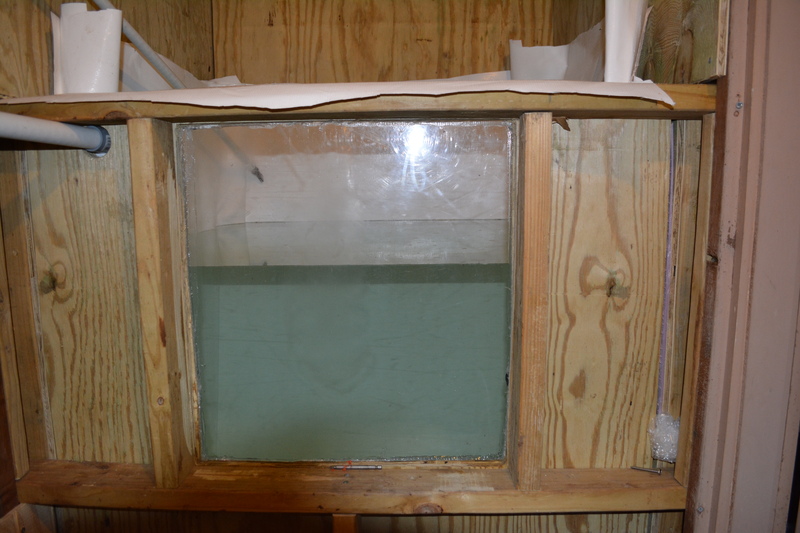 Wonderfully, I have siphoning working for me all around, so the water was easy to put back into the raft tank. Now I just need a silicon bead to place on my acrylic sheet again for a re-seating. Once we get the healthy bacteria levels up to where we want them to be, we an gradually add fish to feed them ammonia and plants to feed and thrive off of the nitrites. We estimate two weeks to dial in onto a healthy start. I will add another video soon that walks through all the post-construction water feature set up. It is about time! All things come together in their proper time, and nearly a year after the greenhouse foundation was laid, we can call the build phase complete. Yay and Phew… Being newlyweds, getting a new and highly intense work project over the year and looking for free rocks for 6 months definitely set us back from ’schedule’, but we have been learning to exercise the Lords principle to take each day and weekend as it comes. Ecc 3:11 puts it humorously: “He has made everything appropriate in its time. He has also set eternity in their heart, yet so that man will not find out the work which God has done from the beginning even to the end.” I really do love my Lords peace about all things and how He has chosen to reveal just enough to us to where we can trust Him if we choose to. It gets really fun when we set a date for an actual launch and want to have friends over. Since the work never really ends, the date needs to be set when enough can be tested and demo’d, with water running and we’ll take it from there. So we set it! On May 3rd, we would love to have our local friends and family over at 1pm to pray and sing songs of dedication to the Lord. 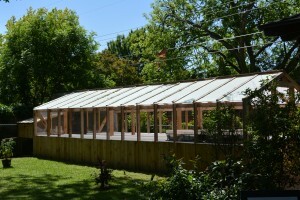 This whole project has been a labor of love and following a vision to tap into His ways of provision. We want to honor Him in this in all our ways and would love to have you with us this weekend. We will be grilling and eating by 2, accompanied with a moderate helping of craft beer for those who enjoy it. We have made a video log of the construction process over the year. 2 are in the first post, and the other three are below, with the most recent first. Clean finish of the rails in prep for the pond liners. Although this topic deserves deep exploration above so many others, all I have time and energy for here is to share what the Lord has been showing me on this today. When you and I talk about liberty, the reaction we often get, whether from others or even within our own polluted conscience, is that of mild contempt. “The notion of liberty is somewhat passe don’t you know, and what about the homeless? Don’t you believe we should put the interests of others above our own gain?” In today’s lost culture, “freedom” and “liberty” have become code words for selfish pursuit, exploitation, and disregard for the needs of others. Why is this the case? In short, it is a vital building block of collectivism. When the goal is the needs of the group over that of the individual, which always results in the exaltation of an elite class or single leader within the group btw, a new morality that despises liberty becomes a necessity. It doesn’t matter if the group is a political body or a local church. Collectivism’s moral demands can be motivated in any combination of mysticism, politics, greed or creed. In contrast to this, Jesus came announcing Himself as the bringer of two things to the people — Healing and Freedom. “The Spirit of the Lord is upon me; he has anointed me to tell the good news to the poor. He has sent me to announce release to the prisoners and recovery of sight to the blind, to set oppressed people free” (Luke 4: 18-19a). When you look at how He delivered on these, He always did it to individuals. The love of the crowds will come and go with each passing day. One day they exalted Jesus as Messiah, the next day they shouted “Crucify him” out of collective interest. But an individual set free from oppression comes to a place where motivation is transformed. The intimate knowledge of the truth is miraculously liberating — that YOU ARE LOVED OF GOD. YOU is an operative word here. Not you as a cog in a wheel, nor as a role player on the team, nor as a citizen in a country, nor as a member of a church, but as an intimately beloved child of the MOST HIGH. So, without further any reinforcement with my words, we must conclude, as scripture does, that freedom is an end unto itself. “It is for freedom that Christ has set us free. Stand firm, then, and do not let yourselves be burdened again by a yoke of slavery.” (Gal 5:1). And, we must also conclude that liberty is our natural and desired state before God. A state for which He died and rose again. A state of being sons and daughters vs being subjects or mere members. Liberty is a moral virtue and an imperative gift from God that we must pursue for ourselves, our families, and all whom we ever hope to sincerely love. Without it, the fruits of our efforts will be our own control, which is always, despite the best intentions, just our own brand of oppression. 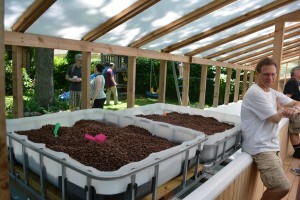 Our LIBERTY leap into AQUAPONICS has begun! For almost 3 years now I have been intrigued and fascinated with the science and responsible beauty of aquaponics. In 2011, I actively discussed moving my family to a place where we could do it, and now, although via a circuitous and totally unexpected route, the actual hands on journey has begun here in the Dallas area. 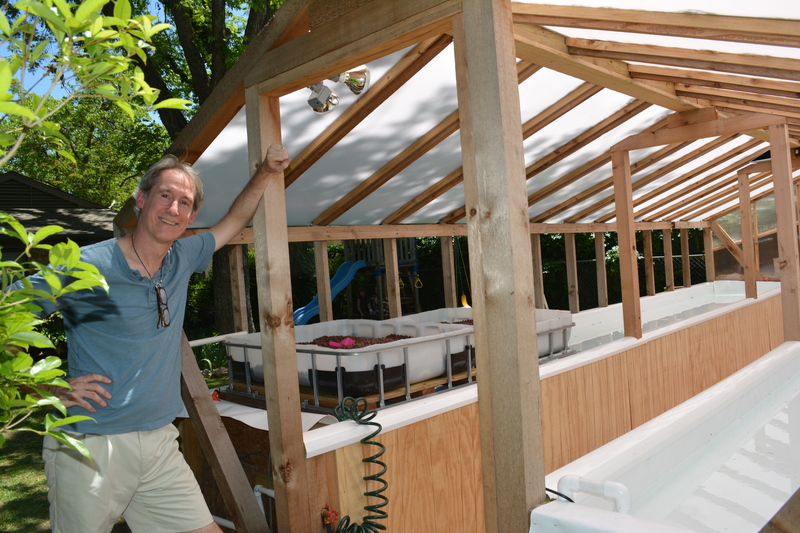 The overarching ‘Christ-gatey-ness’ of aquaponics is the liberating affect of food independence. Food independence is taking responsibility for your own property and family. Your God given liberty wants to extend into your real life, and food independence is a vital component of that. More on the nature of that in future posts. Aquaponics is simply the coolest innovation to achieve this independence by naturally controlling a food producing eco-system in a small space. You can think of it as victory gardens on steroids. So here on Christ Gate I will discuss our personal journey into it as newcomers and seek to help others along the way. My intention is to have a video log of the whole build process, and mix in the needs and opportunities related to aquaponics along the way. This should be fun! Disclaimer: I don’t know anything close to what a REAL framer knows. So if you want the best how-to’s for framing wisdom, you will find better videos out there. Take mine as an inspiration that if ‘this guy can do it, I can do it too’. 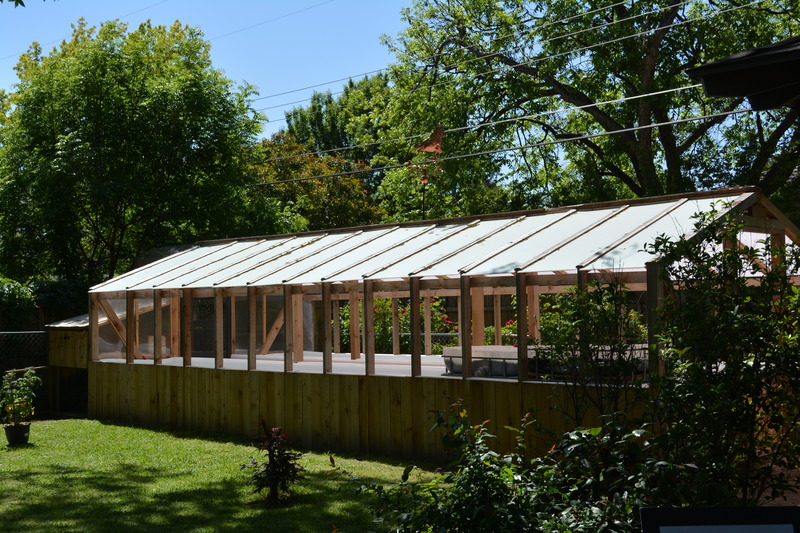 What matters is that a project like this in your own backyard is ACCESSIBLE to you. I am merely a fellow student in rapidly forming new urban farming discipline, so my invitation to you is to follow along and joyfully do likewise, seeking knowledge wherever you can. For 2013, the site is finally back in good looking shape for a new season. All the references to upcoming events are gone until we resume having events. Writing, fellowship and small group meetings are the other things being loosely planned right now. Most people I know still have not seen our main testimony video, so I put that on the home page. Please watch it if you never have before. I decided not to totally rebuild the look of the site, but to modernize the layout a bit and make room for the new theme to rise to the surface. The site will continue to look Indo-US-centric even though no India trips are planned. Life is restarting for Indi-Andy here and in an amazing and unexpected direction. I am in Dallas Texas now with some of the most amazing people at the Upper Room. God is putting together a cadre of Davids and Jonathans — friends who will defend the honor and glory of the Lord over their own lives, and I am so glad to be a part of it with them. Last year was a year of transcendence. This year is a year of redemption, and I am seeing it all take place with uproarious thanksgiving. In preparation for my next post, feel free to read Romans 8 and comment, but not with your focus on the familiar “all things work together” theme, but instead with your spirit on the glory and suffering aspects that come about as we discover, share and stand on the glorious freedom we have been granted in Jesus. Let me get the usual disclaimer out of the way first. Since I have posted so infrequently, this post is subject to having a mish-mash of inspirations and personal updates melded together. I need to shake things out here in this post as what I hope is a great restart to writing effectively again. I feel like I need to find my voice in the areas God is leading me in to and I am just now coming out on the other side of a many major life changes. Part of my current scatteredness is a personal reorientation in the Spirit, and part of it is social media fatigue (ever get that affecting your attention span?). I remember a friend asking me a long time ago what my personal mission statement is. I replied with little hesitation something along the lines of, “to build a bridge of ministry and relationship between the church in America, and the church in India.” I then thought about it for a while and realized: 1) That the whole exercise of trying to boil down my calling, promises, visions and relationships into a single statement has little merit apart from the exercise itself. And 2) I personally am not comfortable elevating a business planning practice to a spiritual plane. We are God’s servants and we miss out from His leading when we engineer our way through our calling. It is western-style insubordination. As I have written before, I want to simply have the testimony of Paul, saying “I was not disobedient to the heavenly vision”. I doubt anyone would really have expected Paul to have published a condensed mission statement, but I am also sure many preachers and scholars look in the epistles for a verse they can ascribe to Paul as one and use it as a launching point to say we all need one too. The western mind seeks a marketing or success formula, but the eastern mind, which includes biblical Israel, seeks a familial infusion instead. I’ll take that, DADDY GOD! Let me explain this a bit before I get to the big announcement. The family infusion pursuit was first introduced by the Lord. He always desired a very direct and close relationship with us as sons and daughters. Not as a teacher who lectures us, but as a father who imparts to us. We from the west tend to exalt our thinking and seek the veneration of men, measuring ourselves based on quantitative scales such as cash, customers and followers. I have fallen into this many times myself, even after being fully aware of the paradigm and tight with the Lord. These days however I happily find myself just less interested in the worldly dynamic as the Lord Himself is my intimate destination. He is wonderful! What do you think freedom is?. It is first spiritual, then mental, emotional, physical then civic. It is found and birthed in conscience before God when He releases you from sin, doubt and fear into communion with Him. Freedom has been the biggest theme in my heart in all things spiritual and relational for years now. While the doors to return to India have remained closed to me since 2008, a growing passion for understanding freedom and imparting it to others has blossomed. I have seen the beauty of it become lost over the years in the hearts and words of my fellow saints however. Perhaps it is partially due to the govt-cultural abuse of the word as code for rallying fighting wars overseas, which is repugnant. In any case, there is a hindering confusion in the ranks of the church which has lost its freedom voice in the culture, preferring instead a pursuit for a seat at the table of human power. A murky and incoherent collectivism of thought and property has taken hold as liberty is no longer seen as a virtue, but as selfish. There is a huge leadership vacuum for the prophetic in this space that I KNOW the Lord has wanted me to fill, and He has confirmed it. Perhaps soon I will find my voice on it, but the first order of business is to just let the fire of God burn in me and make me live and thrive in this freedom myself. That is where the work of the Lord is in all this right now, to free me completely from the expectations and approval of men. I AM FREE from the judgement of others, from the tyranny of men and from the oppression of culture. Scripture BURSTS with proof that the freedom we have been given is not just a side order or a feeling… it is our prized destination in this earth. It is to be appreciated as: the fruit of discipleship (John 8:32), an end unto itself (Gal 5:1,13), proof of the Spirit’s presence (2 Cor 5:17), unalienable from the opinions of others (1 Cor 10:29), something to be guarded (Col 2:16-17), something we are to identify ourselves as (1 Pet 2:16), and, as a subset of the glory we have as the children of God that the creation will be set free in to (Rom 8:21). Unfortunately, we tend to see the warnings accompanying these scriptures more than the verses themselves, allowing self-doubt powered by a false sense of self-sacrifice to devalue what God Himself has put into our hearts to long for. As I was at prayer a few months ago at the Upper Room, the Lord laid on my heart how there are those that passionately value liberty at an external level (civic and/or societal) and a whole different set that passionately values it on a spiritual level. I had hands laid on me regarding dormant dreams to be reawakened, and I know the Lord laid on my heart to bring these two groups together. For this mission, I also need to re-immerse myself in history again. Stay tuned. So here is the announcement. I am going to rework ChristGate.org to broaden it beyond the ‘bridge to India’ theme and make it a place to discuss these issues as the Lord leads me, while also having it remain a resource for India missions. I am praying now about how that can look. The “Nations” concept will certainly fade, as I am done venerating the oppressive institutions of men. The kingdom culture of who we are in Christ is a REAL overlay on the geopolitical realm. The life we NOW live in the body (world too) we live by faith in the Son of God who loved us and gave Himself up for us. One practical aspect of this is to promote food and energy independence from the world system. Gay and I are going to do aquaponics here at the house and want to video log the experience. I am still not sure how ‘christ-gatey’ that all is for the site thematically… I only know Daddy wants me to do it as a component of living free in this world. For any that have questions about my big family changes last year, you are free to call. I am not inclined to discuss those here. The Lord has been revealing some very intimate things to me lately. I have been joining my heart to this prayer movement called The Upper Room in Dallas. Wonderful people who call God Daddy. I love it. Oh yeah… Dallas… Well I am here now. Long story which we can get into at some point. If you know me well, you already know. If you don’t know, find me on Facebook and I will explain or point you to posts about the big reset button and why I am restarting here alone and fresh. The intimate things the Lord is doing in me is part of a personal renewal project…. not mine, but His. My own strength has failed me, so now it is His workmanship that is renewing me, wrecking me from my old world-view and liberating me to discover again how incredible is His love for me and how perfect His one-time sacrifice was that satisfied all that was needed to transform me from a failure scourge to a favored son. Yes and amen. I am going to re-declare what God is doing here, and it will stretch beyond India. It will be about Christ the Gate. The gate to salvation, wisdom, truth, life, love, compassion, vision and intimate fulfillment. Jesus the end in my journey, not a mere means to meet my needs. I have been having a great time in Corinthians lately. Both of them. 2 Cor 3:17 declares, “Where the Spirit of the Lord is, there is liberty”. Context? Well it is about us getting to behold a glory that does not fade. Not only does it not fade away, but we get to see it and we don’t even want to shade our eyes from its brilliance. It is an inviting, wonderful, radiant, approving look of love from our Father. Our pupils get bigger, as we get to cast off our veil of the old self and see His glorious countenance. Now, take a look at verse 18 if that seems just too cool to be true. There are two amazing things here. First, we are perhaps not to be looking quite the way you might think. It says, “beholding as in a mirror”. That has bothered me for years. I always wondered why Paul did not say, “as through a window”, or “directly across the room”, or “intimately face to face”. I don’t know about you, but I don’t use a mirror to look at someone else. I use it to check out my own face (for fixable flaws, and make myself laugh… what?). Mirrors were a fairly new invention in Paul’s day… they were blurry and rough, and Corinth was a town that traded in them to those who could afford one. Think of it as the iFace beta. For the first time, people could see themselves without having to look into a pail of water. This was the dawn of a new kind of physical self-awareness. So here Paul is talking about seeing the glory of the Lord via a mirror. He did it before at the end of 1Cor 13 as well, (and that bothered me too) so this is not just a one-off. Perhaps we should be willing to consider that the best place on Earth to see the glorious workmanship of God is in the face of His most glorious creation - You. Now I know that to suggest that we can see the Lord in our own faces is both dangerous in our narcissistic culture, and offensive to our self loathing nature. Nonetheless, does not the Word declare you and I as new creation wrought in Christ? Is not Christ in you, the hope of glory? Does not even creation itself long to be set free into the glorious liberty of the children of God (Rom 8:21)? Are you not the righteousness of God in Christ Jesus? And, do you not have the same access and opportunity Moses had to the Lord, allowing His light to shine upon you and reflect visibly? So if we look at ourselves via the mirror of the Word, all this begins to make sense. But if we look at other mirrors, then we see ourselves improperly, and more importantly, we see the Lord improperly. Other mirrors are outward, and therefore make the Lord appear far away and disinterested. Physical mirrors really are about us. The ‘vanity’ in my bedroom is a nice place to visit, but I wouldn’t want to live there. For many, our identities are too closely tied with appearances, and thus we obsess over our selves. The world is a powerful mirror. All that look in to it to see themselves are never satisfied. The image we see always has lack, as there is always someone bigger, better, smarter and faster, making us not measure up. Stop looking into other mirrors! They do not reflect a true image. Finally, amidst the beholding of the image, the verse declares that we are being transformed into the same image. The image of what? Of Christ Himself. From glory to glory. Glories can be in minutes during worship, days and seasons — in all phases of how the Lord works with us. Each time you look in the mirror of the Lord and His Word, expect yourself to look a little more like Jesus each time. I just woke up from a dream that I simply must write down. I was living short term in a small foreign suburb, much like where we used to live in India, but the area hd progressed, the buildings were clean and there was very little dust. I was frequenting a certain house that had one common living area and a garage, but with two bedrooms with separate locks and doorbells accommodating two separate tenants. I had a prior interest in this place, but the tenants had moved out and only the garage still had a few items in it, that I was free to search through for something valuable. I dont recall any of the items, but as I was going through things, some soil got under my fingernails. It was particularly irritating under my right middle fingernail, as I could not get it out, so I just left it there and continued with my visit, feeling very familiar to those around me, like I was at a second home. I remember feeling very free in my comings and goings into this house, with friendship and goodwill growing around me in the community. There was a hairstylist next to the house that we trusted, but a fancier one around the corner, where I had kept in my mind that I would refer any new highly affluent friends. After about 3 days, my middle finger started to feel pain and my nail became perforated. I noticed a small green leaf sprout under my nail, and started to pull it out. As I pulled, it stretched out 3 inches from under the nail before breaking off at the root. I pulled on the next little piece of foiliage that I saw under my nail, wanting to get this irritating foreign object out. It also came out 3-4 inches, and I realized there were seeds growing under my nail and some were breaking through the nail itself. I stated to show others and kept pulling at the leaves and larger lengths of stems and roots were coming out. None of them EVER broke off early, but came out whole, from leaf to root. My motivation was mixed between getting these all out and also sharing the intrigue with friends on what a freakshow this was. I found myself walking next to an old ministry friend from India, who in real life has recently turned against me, — he was the only identifiable person in the dream — and this time I pulled out a single green large tubular stem, weighing about 3 ounces. He was impressed, but trying to keep his amazement under control. I said to him, “This is a trip. Hold it in your hand. It feels heavy. How could something like this come out of my finger?”. After this, a distinguished, highly prominent older gentleman came to visit us. He needed his hair cut, and I went to take him to the fancy hairstylist around the corner. As we walked, one last sprout came from my finger and I pulled out what now seemed like a common 5 inch small plant. This was I think the 7th and final time. He saw it and we paused. He smiled and simply told me, “Take me instead to the place where you get your hair cut”. Upon returning to the house, I saw the front door open and new furniture in the main room for the first time. I knocked on the inside bedroom doors, but no one answered until after I had already returned back to the street to inquire as to who had moved in. It turned out it was a new friend I met who had helped me with items in the garage — who was with me when the seeds got under my nails. I only know I was glad to see him restoring the house, trusting that it was the right time to once again see the house be a flourishing place. After I woke up from the dream about 30 minutes ago, one clear interpretation did emerge. Other parts remain as dream fragments, but clear enough to write down, and I trust will be understood in time, or by you, the reader. The seeds that got under my nails are the unseen results of years of prior ministry in India. They only seemed as soil until they sprouted. It was merely a lingering irritant until its true nature was revealed. The sprouts themselves are obviously fruit emerging from a new generation of people, and all were blessed. The middle fingernail is significant, in that our middle finger represents the ministry of the evangelist. Perhaps I should put more emphasis there going forward vs. pursuing other gifts evident in our pastors conferences. The overall vibe of the visit in the village was a peaceful sense of returning home. I was at peace with the process of all that God has done and will continue to do as new people take the lead and we remain connected. I woke up feeling that the dream taught me that there will always be a home and a flourishing community for us in India. Your thoughts are sought, and are welcome. Living in India, it was always a wonder and a treat to celebrate Pentecost Sunday as a key Christian Holiday each year. Making this day special was something I have never really experienced here in the US apart from seeing it highlighted on a Foursquare calendar here and there. This year, having been back in the US for a while now, I would have missed it, except for seeing an invitation on Facebook to join in prayer for India this Sunday. I’ll be there at Grace tomorrow and would be happy to pray together with anyone between services at 10:45ish. Otherwise, let’s all set some time aside tomorrow in Prayer for India and all day in celebration of God’s infilling power in our lives by The Holy Spirit of God!